16-12-2013 - Buell XB and 1125 recommended suspension settings as published in the Buell owners manual. If you miss your model / year in the list please contact us, we are working to get this list completed when we have time. All Buell Motorcycles like a well set up suspension and will make your bike corner very well after doing that. We see a lot of bad setup's with customers. Please note these are the basics settings, for road use, for most people these will do perfect. Before you change settings on your bike please check tire pressure This will always work if your tyre pressure is set. Try to start with 2.5 bar front and 2.6 bar rear. 2. Change the preload by turning the preload adjuster at the upper part of the shock with the SHOCK SPANNER WRENCH found in the tool kit..
a. Rotate adjuster clockwise to increase preload. b. Rotate adjuster counterclockwise to decrease preload. 1. 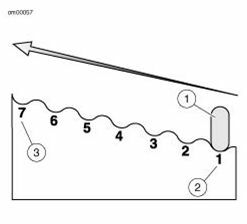 See Front Fork Preload and Rebound Adjuster: Check number of lines to be showing (3) for your load condition on the pre 2009 models, on the later models Turn preload adjuster nut (1) counterclockwise until it stops. This is the minimum preload setting. Both forks should display the same number of alignment lines. Forks that are not properly aligned can lead to loss of control, which could result in death or serious injury. 1. Turn the adjuster (2) with a wrench to the desired setting. Adjust suspension to the recommendation if possible, but never force adjusters beyond the mechanical stops. 1. 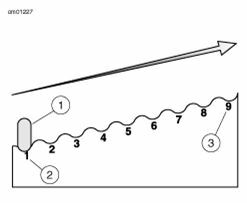 See Front Fork Preload and Rebound Adjuster: . Using a screwdriver, turn the rebound adjuster screw (1) clockwise until it stops. This is the maximum rebound damping setting. 2. Turn the adjuster screw counterclockwise the recommended amount specified. 1. 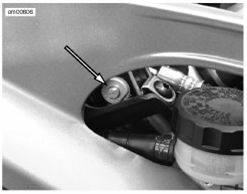 Using a screwdriver, turn the compression damping adjuster clockwise until it stops. This is the maximum compression damping setting. 2. Turn the adjuster counterclockwise the recommended amount specified. 1. Using a screwdriver, turn the rebound adjuster clockwise until it stops. This is the maximum rebound damping setting. 2. Turn the rebound adjuster counterclockwise the recommended amount specified. 2. Turn the compression adjuster counterclockwise the recommended amount specified. The stock settings are designed to offer sufficient chassis control, but some may choose to enhance ride comfort over rougher road conditions or for long rides. Adjusting the compression setting will reduce both high and low speed damping. 2. 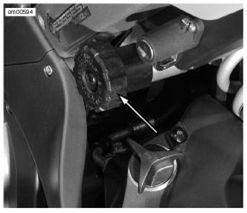 Increase ride quality by reducing front and rear compression damping by turning adjuster counterclockwise 1/4-1 turn. 3. If additional ride quality is desired, reduce front preload by turning adjuster counterclockwise until an additional line is visible and also reduce rear preload 4 turns (8 clicks). 4. If maximum ride quality is desired, decrease front and rear rebound damping by turning adjusters counterclockwise by 1/4-1/2 turn. The response to steering input (quickness) may be enhanced by adjusting the vehicles front/rear ride height. This adjustment effectively decreases the vehicles rake angle. This is achieved by adjusting the preload to increase front sag and reduce rear sag. 2. Reduce steering effort by increasing the rear preload 4 turns (8 clicks). 3. 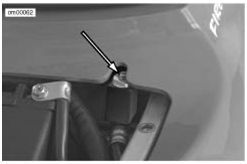 If more enhanced steering and cornering control is desired, reduce front preload by turning adjuster counterclockwise until an additional line is visible. 4. If additional enhanced steering and cornering control is desired, increase rear compression damping by turning adjuster clockwise by 1/4-1/2 turn. All compression and rebound settings are the number of turns out from maximum. * All damping adjustments are turns out from maximum. *Both Front and Rear Spring Preload is set by loosening adjuster counterclockwise until it stops at minimum and then counting the number of turns in to get to the desired setting. The rear preload knob clicks every 1/2 turn. **All damping adjuster settings are done by tightening adjuster clockwise until it stops at maximum setting and then counting the turns counterclockwise to get to the desired setting. ***Load includes rider, passenger, cargo, accessories and riding gear. 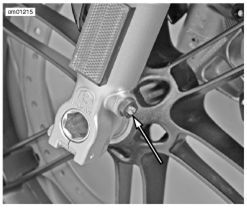 *Front fork preload is set by loosening adjuster counterclockwise until adjuster stops at minimum and then counting the number of turns in to get to the desired settings. ***XB12X Load includes rider, passenger, cargo, accessories and riding gear. Bike feels loose or vague after bumps. 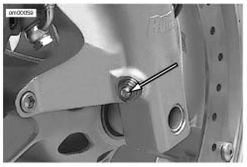 Wheel tends to "pogo" or suffer continuous bouncing after passing a bump. This is often noticable by watching the bike as it travels over bumps. Wheel responds to bump but doesn't return to ground quickly after bumps. This is more pronounced over a series of bumps and is often referred to as "packing down." Bike bottoms in dips or while cornering. Bike has excessive brake dive. Harsh ride, particularly over washboard surfaces. Bumps transfer through handlebars or seat. Suspension seems not to respond to bumps. Tires chatter through corners or rider is jolted over rough roads. Each Buell motorcycle uses suspension components tailored to the vehicle's weight and function. 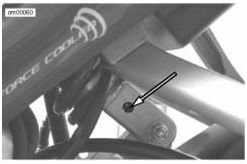 On all models, the front and rear preload setting will need to be adjusted for the rider's weight and cargo. This adjustment should be made before the motorcycle is ridden any distance and after changing the overall vehicle weight (adding saddlebags, etc.). Your Buell dealer can assist you in setting the preload when you take delivery of your motorcycle. If the preload adjustment is correct, and you have the rebound and compression damping set at the factory recommended points, the motorcycle should handle and ride properly. Damping is set at the factory for the average solo rider under normal riding conditions. The rider may make adjustments to compensate for individual riding styles and varying road conditions. Evaluating and changing the rebound and compression damping is a very subjective process with many variables and should be approached carefully. Damping: Resistance to movement. Damping affects how easily the suspension can move and limits oscillations of the system once movement has begun. Compression: The suspension is compressed when the wheel moves upward. Rebound: The suspension is rebounding when it is moving back from being compressed. Vehicle Sag: The amount the rear shock and fork springs are compressed by the weight of the motorcycle. Rider Sag: The amount the rear shock and fork springs are compressed by the weight of the rider on the motorcycle. Preload: An adjustment made to the rear shock and front fork springs to limit vehicle and rider sag to a standard percentage of total suspension travel. Before evaluating and adjusting suspension settings, check the motorcycle's tires. They must be in good condition and properly inflated. See Factory Suspension Settings: The settings are the best balance of handling, ride, and stability. Suspension can be changed to accommodate rider preferences for ride quality and handling for road conditions and load changes. Do not continue to repeat the steps involved with the following settings beyond those which are listed. Changes in the load carried requires changes in the preload setting(s). Carrying less weight than was used for setting up the suspension requires decreasing the amount of preload. Increasing the load carried requires adding more preload. GVWR is the sum of the weight of the motorcycle, accessories, and the maximum weight of the rider, passenger and cargo that can be safely carried. The GVWR and GAWR are shown on the information plate, located on the frame steering head. 3. If additional ride quality is desired, reduce front preload by turning adjuster counterclockwise one turn. 2. Reduce steering effort by increasing the rear preload one position. 3. If more enhanced steering and cornering control is desired, reduce front preload by turning adjuster counterclockwise one turn. 5. If maximum enhanced steering and cornering control is desired, increase front rebound damping by turning adjuster clockwise 1/4 turn. To provide more road surface feedback on smoother road conditions, increase compression and rebound settings. 2. 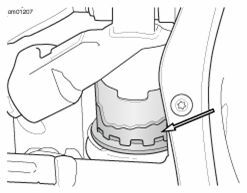 Increase chassis/handling control by increasing front and rear compression damping by turning adjuster clockwise by 1/2-1 1/2 turns. 3. If maximum chassis control/handling control is desired, increase front and rear rebound damping by turning adjuster clockwise by 1/4-1/2 turn. Make all suspension adjustments in small increments. Radical setting changes may cause you to skip the best adjustment, but always remember that any setting chosen is a compromise. Possible suspension and operating characteristics and their probable causes are listed. This table is helpful in keeping your motorcycle in good operating condition. To achieve the proper settings you will need the preload properly adjusted, the tires properly inflated and a familiar bumpy road. It is useful if the road contains a variety of different kinds of bumps from small sharp bumps such as potholes or frost heaves to large cracks. See Factory Suspension Settings: Begin the process by putting all the damping settings as recommended. Ride the motorcycle over a variety of surfaces and bumps at different speeds. 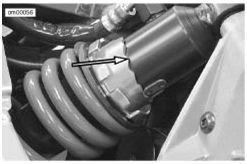 If the suspension is set properly, the vehicle will feel stable and comfortable. The GVWR and GAWR are shown on the information plate located on the frame steering head. 2. 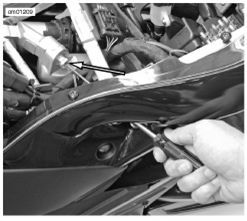 Change the preload by turning the preload adjuster at the upper part of the shock with the SHOCK SPANNER WRENCH found in the tool kit. 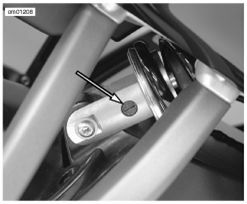 See Factory Suspension Settings: Buell 1125 Models for factory settings. a. Rotate adjuster counterclockwise to increase preload. b. Rotate adjuster clockwise to decrease preload. 1. Turn preload adjuster nut (2) counterclockwise until it stops. This is the minimum preload setting. 2. 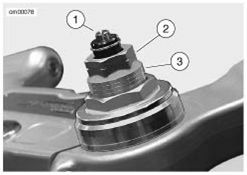 Turn the preload adjuster nut clockwise the recommended amount specified in Factory Suspension Settings: Buell 1125 Models. 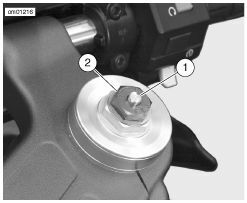 For the recommended rebound and compression damping settings for various road and riding conditions, see Factory Suspension Settings: Buell 1125 Models. 1. Using a screwdriver, turn the rebound adjuster screw (1) clockwise until it stops. This is the maximum rebound damping setting. 1. Using the 3mm ball end wrench from the tool kit, turn the compression adjuster clockwise until it stops. This is the maximum compression damping setting. *Front spring preload is set by loosening adjuster counterclockwise until it stops at minimum, then counting the number of turns in to get to the desired setting. **All damping adjuster settings are done by tightening adjuster clockwise until it stops at maximum setting, then counting the turns counterclockwise to the desired setting.